Both of the District Twelve tributes survived the seventy-fourth Hunger Games with a simple act of subversion towards the Capital. Now, they both have posh houses outside of the ghetto that comprises District Twelve, more than enough food and money than they can devour or spend in a lifetime. Life is not all sweet for Katniss Everdeen or Peeta Mellark's with it becoming slightly more complicated since they have to continue on a Victory Tour through all twelve districts and face the families of their defeated opponents. It is also clear that the Capital is not happy (at all) about how the last Hunger Games have ended (they fear it is going to start a brewing rebellion) and have decided to rectify these results during the Quarter Quell (a special version of the Hunger Games which occurs every twenty-five years). The rules are set, all previous victors of the Hunger Games must submit to the lottery and as luck would have it, Katniss and Peeta must return to the arena. As many of you might remember from my entry for the first entry in this series, I really enjoy the world that Suzanne Collins has crafted. Indeed, it is a book geared towards youth and young adults but this does not make it inaccessible for adults such as yours truly. This standard is continued into the second novel with one exception. Collins decides to examine the theme of independence/ interdependence (also, the idea of personal identity) through the lens of Katniss' relationship with both Peeta and Gale (her dearest friend)... Faster than you can say, Team Jacob... Bam, love triangle! Comparing this element of the novel to Twilight's is reckless since that novel had no depth and thus does not know what a theme is. This was my least favorite aspect of the novel and while I understood its purpose, I felt it went on for a little too long. Yet, it did not ruin my enjoyment of the novel, I just felt that it took pages away from setting up the obvious civil war that will break out in the third novel (This is not a spoiler alert if you see it coming). This is but a small complaint for this novel as Collins' still keeps your interest with the cliffhanger chapter endings and the revelation about the lost District (13). 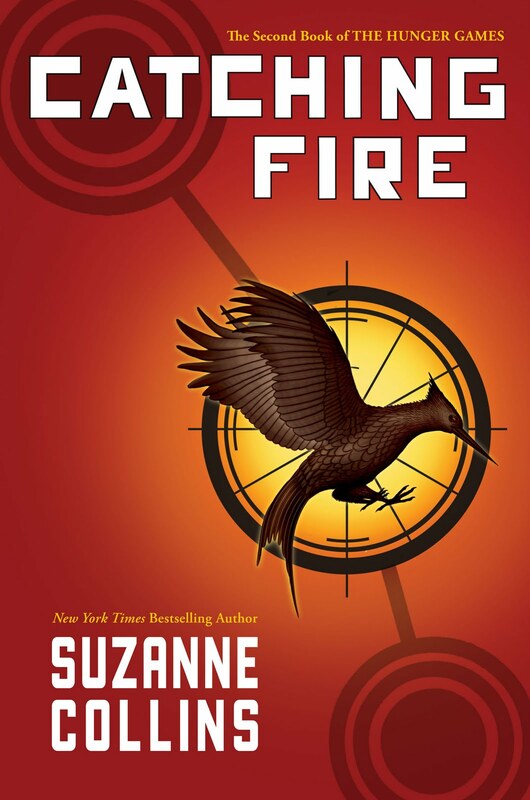 As a book intended for a teenage demographic, Catching Fire is an intelligent novel and the prose reflects this. It is hard for me to not enjoy a novel that deals with the complexities of a civil war when one of my college degrees was predicated on an examination of conflict studies (among other sub-concentrations). Furthermore, the ending was something that even I did not see happening even though I had prided myself on guessing plot points before they had happened. Much like The Hunger Games, I give this book my approval as it is an enjoyable story which lives up to its predecessor. What else would you read... Twilight (I had to get in one more jab)? Even if you may be teen reading this review or an adult, you would be more discerning than that... After all, you ended up here. Please forgive the ego stroking, I do not know what came over me. See you next time... Ladies and Gents.